This is a branch of medicine that uses radiation to provide information about the functioning of a person's specific organs or to treat disease. In most cases, the information is used by physicians to make a quick, accurate diagnosis of the patient's illness. 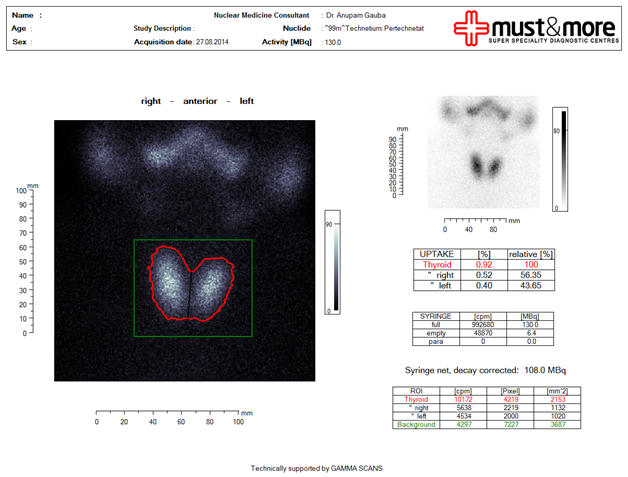 The thyroid, bones, heart, liver and many other organs can be easily imaged, and disorders in their function revealed. In some cases radiation can be used to treat diseased organs, or tumors. 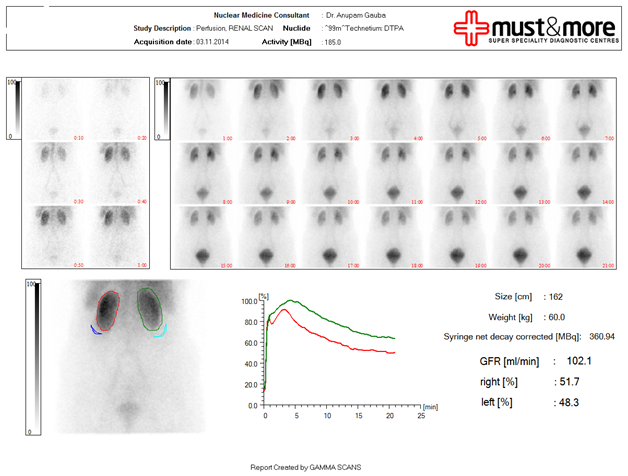 Nuclear medicine uses radioisotopes in minimal quantities weighing in nano to pico grams with radiation exposure as low as or even less than that of a normal X ray. 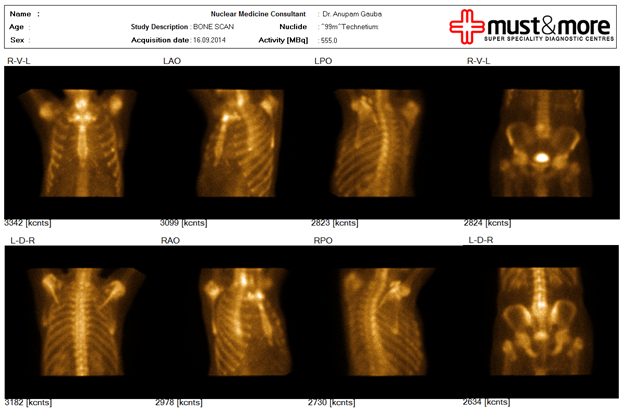 In most scans, nuclear medicine procedures make a motion picture of the organ and determine the function & functional reserve of an organ. The radiopharmaceutical is chosen so as to incorporate itself in a normal metabolic cycle of human body without any disruption of physiology and with minimal or no side effects. These tracers are generally short- lived isotopes linked to chemical compounds which permit specific physiological processes to be scrutinized. They can be given by injection, inhalation or orally. A distinct advantage of nuclear imaging over x-ray techniques is that both bone and soft tissue can be imaged very successfully. This has led to its common use in developed countries where the probability of anyone having such a test is about one in two and rising. The mean effective dose is 4.6 mSv per diagnostic procedure. 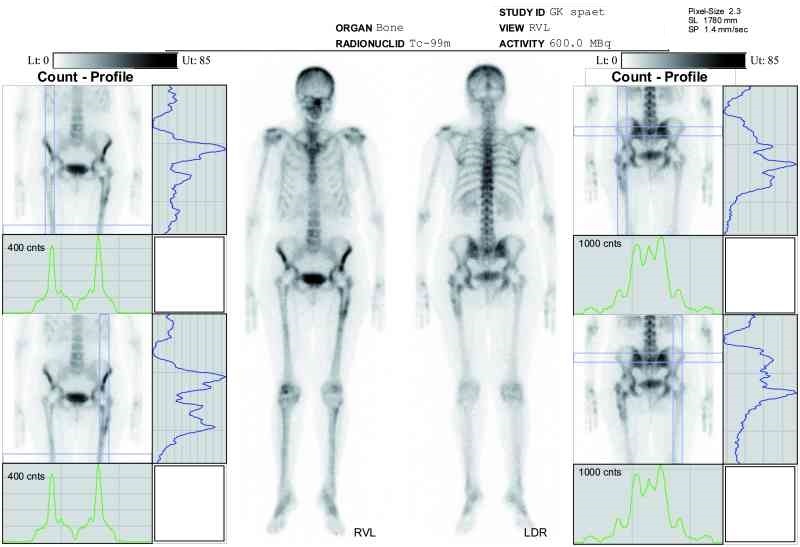 Some of the commonly done nuclear medicine scans are DTPA scan, DMSA scan, stress Thallium, HIDA scan, GI bleed scan, Bone scan, Thyroid scan, Parathyroid scan etc to name a few. Nuclear medicine imaging procedures are very safe and can be safely used even in all including infants/children, very sick patients and patients with advanced renal disease, coronary artery disease (heart patients), diabetics, hypertensive etc. The amount of radiation in a conventional nuclear imaging procedure is comparable to that received during a diagnostic X ray. Provide information that is inaccessible with other imaging technologies or that would require more invasive procedures such as biopsy or surgery. Identify disease in its earliest stages and determine the exact location of a disease/ tumor, often before symptoms occur or abnormalities can be detected with other diagnostic tests. Identify as well as quantify the damage caused by a particular disease/tumor. Guide the physician to evaluate prognosis & choose the right course of treatment. 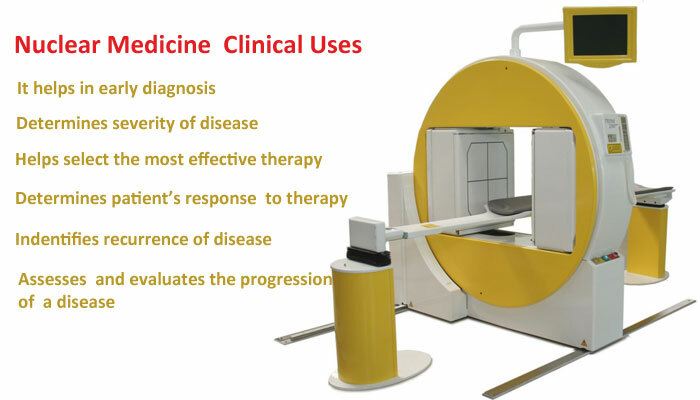 HOW NUCLEAR MEDICINE HELP PATIENTS? Identify reappearance of disease and help manage ongoing care. Determine a patient response to treatment. Acclimatize treatment plans quickly in response to changes in cellular activity. Evaluate progression of disease in chronic diseases such as Hypertension, Renal disease, Heart diseases (coronary artery disease). Select the most effective therapy based on the unique biologic characteristics of the patient and the extent of disease. 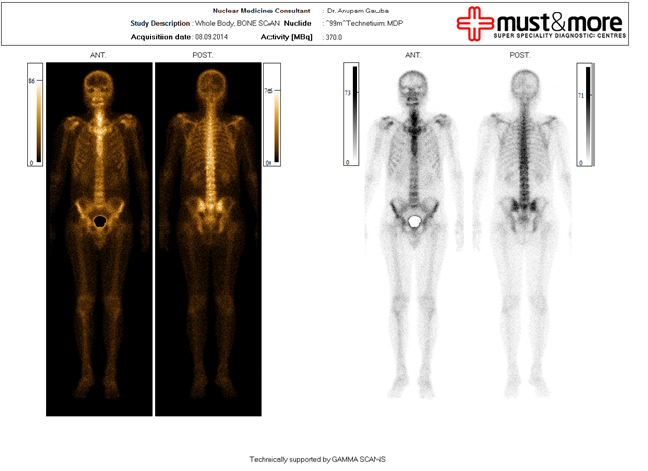 In a nuclear medicine test, small amounts of radio pharmaceuticals (radioactive medicines) are introduced into the body by injection, swallowing, or inhalation. Radio pharmaceuticals are chosen to attract to specific organs, bones, or tissues, depending on the medical history. The amount of radio pharmaceutical used is carefully selected to provide the least amount of radiation exposure to the patient but ensure an accurate test. A special camera (SPECT or gamma camera) is then used to take motion pictures of your body. The camera detects the radio pharmaceutical in the organ, bone or tissue and forms images that provide data and information about the area in question. Nuclear medicine procedures are among the safest diagnostic imaging exams available. To obtain diagnostic information, a patient is given a very small amount of a radio pharmaceutical. Because such a small amount is used, the amount of radiation received from a nuclear medicine procedure is comparable to, or often at times less than, that of a diagnostic x-ray. The nuclear medicine team at MUST & MOREcarefully examines the patients history perform the most appropriate examination for the patient particular medical problem and thereby avoid any unnecessary radiation exposure. Although we dont think much about it, everyone is continually exposed to radiation from natural and man made sources. For most people, natural background radiation from air and space, rocks, soil, and even atoms in your own body, accounts for 85 percent of the radiation you receive annually. Additional exposure to radiation comes from consumer products such as household smoke detectors, color television sets, and luminous clock dials. The remaining radiation is from x-rays and radioactive materials used for medical diagnosis and therapy. Most nuclear medicine procedures expose patients to about the same amount of radiation as they receive in a few months of normal living. 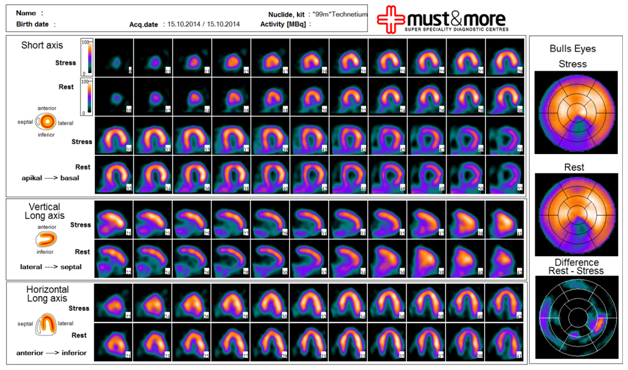 Myocardial perfusion scan or stress thallium is the only procedure to evaluate the micro vascular damage caused to the blood vessels of heart (coronaries) and is helpful in early diagnosis of Coronary Artery Disease in patient suffering from diabetes. It is a very safe procedure and has no known severe contrast reactions as are seen in CT angiography and can be safely performed in all age groups and even in patients with renal dysfunction.